Stryker's attempt to replicate his success with Wolverine accidentally mutated Victor Creed into the larger, more bestial form - after which Creed's memory was erased. However, I don't recall any scenes where the big blonde Sabretooth was referred to as Victor Creed. If that's the case, this would seem to leave open the possibility that he and the Sabretooth seen in X-Men Origins: Wolverine are two separate individuals using the same codename. Is the Sabretooth from X-Men (2000) ever referred to on-screen as Victor Creed? TL;DR: his civilian name is not revealed in the first movie, but there are elements from other works which hint at the tie-in comics confirm Sabretooth being indeed Victor Creed. It's unclear whether the two are the same individual. Sabretooth isn't referred to as Victor Creed in the final cut. In fact, as you may have noticed, his role is basically the muscle one: doesn't talk much, isn't talked much to or about, no character development etc. PROFESSOR X: The man who attacked you is an associate of his [Magneto] called Sabretooth. WOLVERINE: (scoffs) Sabretooth? Storm. What do they call you? Wheels? This is the stupidest thing I've ever heard. He's not given a name in the credits either, though to be fair, only Logan/Wolverine is given both names in said credits. In this comic tie-in to the movie, Wolverine travels to Alkali Lake and gets attacked by Sabretooth. While the two wrestle, Wolverine notices Sabretooth has got dog tags similar to his, so they go all buddy-buddy, and discuss their lost memories around a beer. Sabretooth reveals he thinks his name is Victor Creed. 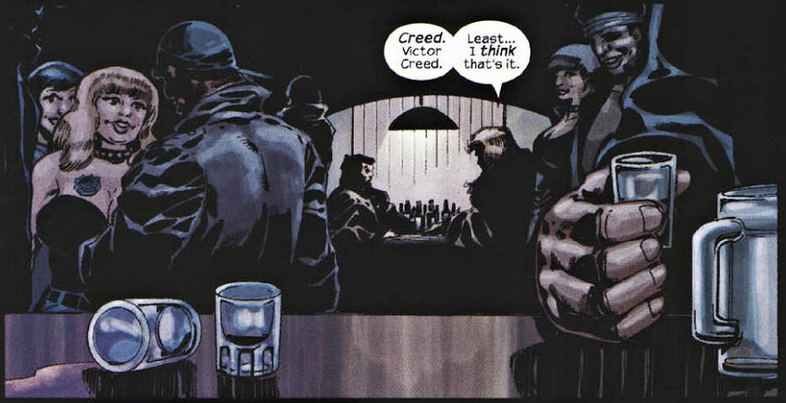 This is confirmed later in the issue when Stryker also refers to Sabretooth as "Creed". Stryker is most likely to know his true identity for sure, as he experimented on him. The following elements were less definite "hints" at Sabertooth being Victor Creed, written prior to my finding of above comic. I'm leaving them in this answer as they are still of value. The highlighted one reads "Creed, Victor". 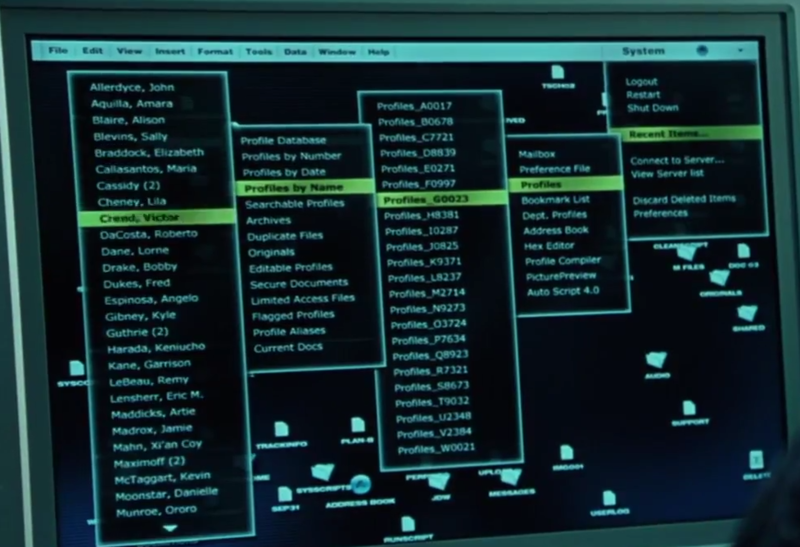 While no other information is given, it's not that big of a stretch to think the writers only considered one Sabretooth in this universe, who would then be the Victor Creed in Stryker's files. Indeed, the later Origins movie started to take shape in 2004, way after X-Men 2 was written and released. It's worth underlining that in an earlier version of the script, Sabretooth was indeed referred to as Creed. Then again, this June 1994 script differs greatly from the final result. Just imagine, though: at some point, Wolverine was hired to bring back a rogue Sabretooth, and the two of them met and fight in a high-class restaurant. Sabretooth. These two hate each other lots. Logan. Grab a seat. We need to talk. now. Working on a sort of a... crusade. Sabretooth. A completely raw steak, with garnish. The waiter splits. Creed cuts the meat with a forefinger claw. The name Creed disappears in a later version of the script (February 1999). What exactly happened between X-Men and X-Men Origins: Wolverine that you did not reprise your role? That was the producers’ decision. The storyline was them rising as brothers, and Liev [Schreiber] and Hugh look a lot closer in that respect, so I understand. I can’t say I wasn’t disappointed. I’d love to get my claws back into that role. But that’s Hollywood. Whether they were indeed the same character is blurry; while the movie's setting would try and make us think they are, X-Men Origins: Wolverine offered no explanation for what happened to Victor (especially, if he was dead), why he went blonde, etc, etc. The "Stryker experimented stuff on him" theory could hold, but I found no official confirmation for this. To be honest, I think everybody is better off forgetting X-Men Origins: Wolverine ever happened. Not the answer you're looking for? Browse other questions tagged marvel x-men x-men-cinematic-universe x-men-origins-wolverine x-men-2000 or ask your own question. In X-Men Origins: Wolverine, is Zero a mutant? Is Deadpool from the movie the same character as Wade in X-Men Origins Wolverine?